The structur o the DNA dooble helix. The atoms in the structur are colour-codit bi element an the detailed structures o twa base pairs are shawn in the bottom richt. Deoxyribonucleic acid (DNA) is a molecule that cairies the genetic instructions uised in the growthe, development, functionin an reproduction o aw kent livin organisms an mony viruses. DNA an RNA are nucleic acids; alongside proteins, lipids an complex carbohydrates (polysaccharides), thay are ane o the fower major types o macromolecules that are essential for aw kent forms o life. Maist DNA molecules conseest o twa biopolymer strands coiled aroond ilk ither tae form a dooble helix. The twa DNA strands are termed polynucleotides syne thay are componed o simpler monomer units cried nucleotides. Ilk nucleotide is componed o ane o fower nitrogen-conteenin nucleobases — cytosine (C), guanine (G), adenine (A), or thymine (T) — a succar cried deoxyribose, an a phosphate group. The nucleotides are joined tae ane anither in a cheen bi covalent bonds atween the succar o ane nucleotide an the phosphate o the next, resultin in an alternatin succar-phosphate backbane. The nitrogenous bases o the twa separate polynucleotide strands are boond thegither, accordin tae base pairin rules (A wi T, an C wi G), wi hydrogen bonds tae mak dooble-strandit DNA. The tot amount o relatit DNA base pairs on Yird is estimatit at 5.0 x 1037 an wechts 50 billion tonnes. In comparison the tot mass o the biosphere haes been estimatit tae be as much as 4 trillion tons o carbon (TtC). DNA stores biological information. The DNA backbone is resistant tae cleavage, an baith strands o the dooble-strandit structur store the same biological information. This information is replicated as an when the twa strands separate. A lairge pairt o DNA (mair nor 98% for humans) is non-codin, meanin that thir sections dae nae serve as patterns for protein sequences. The twa strands o DNA run in opposite directions tae each ither an are thus antiparallel. Attached tae each succar is ane o fower types o nucleobases (informally, bases). It is the sequence o thir fower nucleobases alang the backbone that encodes biological information. RNA strands are creautit uisin DNA strands as a template in a process cried transcription. Unner the genetic code, thir RNA strands are translated tae specify the sequence o amino acids within proteins in a process cried translation. Within eukaryotic cells DNA is organised intae lang structures cried chromosomes. In cell diveesion thir chromosomes are duplicated in the process o DNA replication, providin each cell its ain complete set o chromosomes. Eukaryotic organisms (ainimals, plants, fungi, an protists) store maist o thair DNA inside the cell nucleus an some o thair DNA in organelles, sic as mitochondria or chloroplasts. In contrast prokaryotes (bacteria an archaea) store thair DNA anly in the cytoplasm. Within the eukaryotic chromosomes, chromatin proteins sic as histones compact an organise DNA. Thir compact structures guide the interactions atween DNA an ither proteins, helpin control which pairts o the DNA are transcribed. DNA wis first isolated bi Friedrich Miescher in 1869. Its molecular structur wis identified bi James Watson an Francis Crick in 1953, whase model-biggin efforts war guidit bi X-ray diffraction data acquired bi Raymond Gosling, wha wis a post-graduate student o Rosalind Franklin. DNA is uised bi researchers as a molecular tuil tae explore physical laws an theories, sic as the ergodic theorem an the theory o elasticity. The unique material properties o DNA hae made it an attractive molecule for material scientists an engineers interested in micro- an nano-fabrication. Amang notable advances in this field are DNA origami an DNA-based hybrid materials. ↑ Alberts B, Johnson A, Lewis J, Raff M, Roberts K, Walter P (2014). Molecular Biology of the Cell (6th ed.). Garland. p. Chapter 4: DNA, Chromosomes and Genomes. ISBN 9780815344322. ↑ Purcell A. "DNA". Basic Biology. ↑ Nuwer R (18 July 2015). "Counting All the DNA on Earth". The New York Times. New York: The New York Times Company. ISSN 0362-4331. Retrieved 2015-07-18. ↑ Mashaghi A, Katan A (2013). 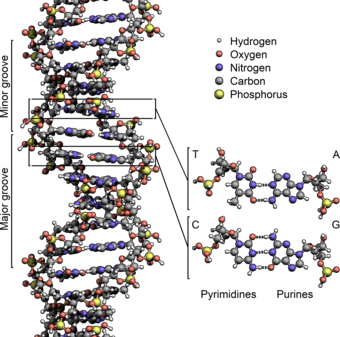 "A physicist's view of DNA". De Physicus. 24e (3): 59–61. arXiv:1311.2545v1  . Bibcode:2013arXiv1311.2545M. This page wis last eeditit on 11 Mey 2017, at 02:19.